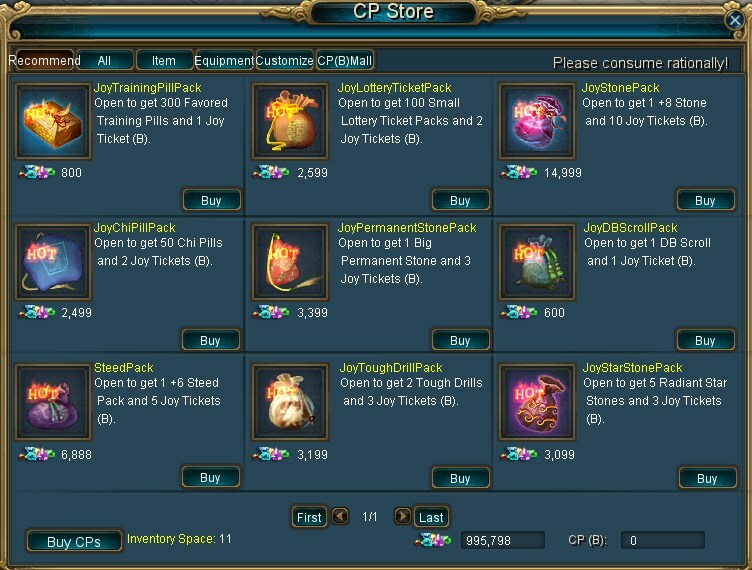 NPC Pack Supplier sells various Packs, if you buy packs from him, you'll receive corresponding amount of Joy Tickets, then you can use the tickets to enter Joy Treasury to pick up abundant Treasure! Check out the detailed information of the Packs. Open to get 300 Favored Training Pills and 1 Joy Tickets (B). Open to get 100 Small Lottery Ticket Packs and 2 Joy Tickets (B). Open to get 1 +8 Stone and 10 Joy Tickets (B). Open to get 50 Chi Pills and 2 Joy Tickets (B). Open to get 1 Big Permanent Stone and 3 Joy Tickets (B). Open to get 1 DB Scroll and 1 Joy Tickets (B). Open to choose 1 +6 Steed Pack and 5 Joy Tickets (B). You can choose one +6 rare steed from +6 Spitfire, +6 Frostbite, +6 Blazehoff, +6 Spotted Steed and +6 Zebra. Open to get 2 Tough Drills and 3 Joy Tickets (B). Open to get 5 Radiant Star Stones and 3 Joy Tickets (B). You can use the Joy Ticket to enter the Joy Treasury, which may contain +6 Stone, +6 Steed, Tough Drill, etc. You'll have only 5 seconds to pick up what you want, so make the best use of your time! Note: The precious items like +6 Stone, +6 Steed, Tough Drill do not appear in Joy Treasury for sure, they have a chance to appear in Joy Treasury. Besides, you can also purchase items at favorable price at Hot Item Promoter. Check out the details below. Description: Right click to release a demon and kill it! If you're lucky enough, you may even find 1,380 CPs! Description: Right click to release a demon and kill it! If you're lucky enough, you may even find 6,900 CPs! Description: Right click to release a demon and kill it! If you're lucky enough, you may even find 13,800 CPs! Description: Right click to release a demon and kill it! If you're lucky enough, you may even find 69,000 CPs! Description: Right click to release a demon and kill it! If you're lucky enough, you may even find 138,000 CPs! Description: Open to receive 11 Demon Boxes. Description: Open to receive 11 Ancient Demon Boxes. Description: Open to receive 11 Flood Demon Boxes. Description: Open to receive 11 Chaos Demon Boxes. Description: Only need to pay 700 CPs to get a DB Scroll. Description: Open to receive a Permanent Stone. Description: Open it to get a Dragon Ball. Description: Special Tortoise Gem Pack, open it to receive a Super Tortoise Gem. Description: Special Magical Bottle Pack, open it to receive a Magical Bottle (B). Description: Special Gourd Pack, open it to receive a Miraculous Gourd (B). Description: Open to receive 10 Vital Pill. Description: When you meet the requirements of the 2nd rebirth, you can use it to get reborn, without completing the 2nd rebirth quest. Description: Open to get 100 Favored Training Pills. Description: Open to get 20 Senior Training Pills. Description: Open to receive 50 Super Protection Pills (B). Description: Open to get a +5 Stone, up to 5 times, before January 31st Cost: 599, 579, 559, 539, and 519 CPs, orderly. Description：Open to get a +3 Stone, and a chance to win 9, 19, 29, 39, 49, 59, or even 108 CPs. Description：Special Tough Drill Pack, open it to receive a Tough Drill.